The 365 Days Project (not to be confused with the Year Long Graphic Novel Project, which you can participate in this Saturday) was a great blog where they posted a weird audio track every day for a year… and you can still download them all. A few of the tracks on there that I’ve heard are cartoonist related, so I thought I would recommend them here. I’m Always Chasing Rainbows by Basil Wolverton. Wolverton is one of my favorite cartoonists, and now I love his music too… if anyone has any more recordings by him, I’d love to hear them. His music fits his comics perfectly… corny, bizarre, and charming. 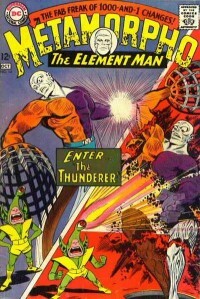 And finally, the Metamorpho Theme Song… I have no idea why this didn’t catch on like the Batman Theme. Speaking of singing cartoonists, I caught the Roe Family singers on Monday for the second time… they now have a regular Monday gig at the newly remodeled and cozy 331 Club… every Monday night from 9:00-10:30, no cover. Conspirator Quillan Roe and his wife Kim play with Conspirator Adam Wirzfeld on the musical saw… the music is fabulous, old-timey and varied, from Fats Waller and Hank Williams covers to spirituals. It is easily the best way you could possibly spend a Monday night in the Twin Cities.